A fluffy brush with a peculiar tapered tip. Professional and multitasking brush with synthetic dual colour and flower bud shaped bristles. 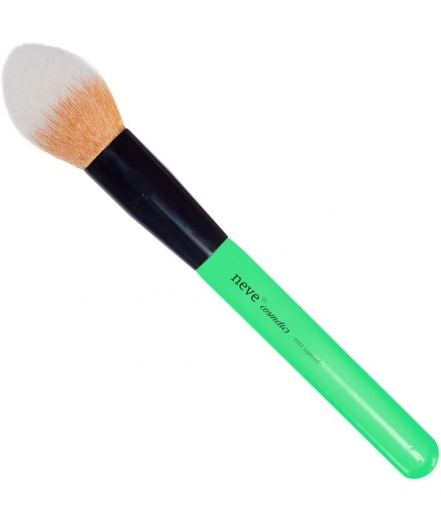 Perfect for applying face powders and to get blended light and shadow effects with blushes, highlighters and bronzers. Mint green, varnished wooden handle with a shiny finish, shiny black, polished metal ferrule, dual-colour bristles made from cruelty-free synthetic fibre. Uses: blushes, powders, bronzers, highlighters and contouring products. Max. brush lenght: 21,10 cm. Max. hair lenght: 4,45 cm. Max. hair width at the base: 1,90 cm.